In Indiana, when talk centers on "March Madness," most people think basketball. Not me. All I can think about is varmint hunting and getting outdoors. Even though I’ve been varmint hunting for over 40 years, my excitement for the sport swells from year to year. In anticipation of groundhog season, I spend at least four to six weeks preparing for the hunt. It not only feels good to get outside and walk the fields after a long, hard winter, but it also increases the likelihood that I will get "lucky." To date, my record stands at 10 groundhogs in one afternoon from one location. Dumb luck? Hardly. To minimize the potential for errors and omissions, I developed an organized, codified system that works for me. In part, this means that before I start working any field, new or old, I acquaint myself with the lay of the land, determine my vantage point, locate the burrows, establish the ranges therein and check for safe angles of fire. Recently, a friend introduced me to a local farmer who gave me permission to hunt on his 40-acre field of soybeans with a drainage ditch running through it. Using this particular field as my model, let’s walk through the preparation process I follow that will maximize my potential for success. Every field is unique. Some fields are more productive in the mornings (6-8) while others are more productive in the afternoons (3-6). To determine the best time to hunt this 40-acre field, I watch the wildlife activity. 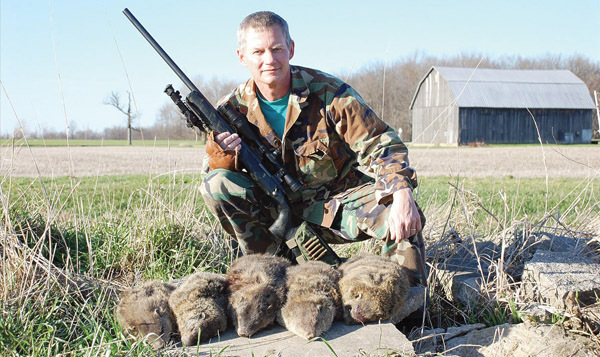 Generally speaking, here in northeast Indiana, the high activity hours for most of the fields I hunt run from 3 to 6p.m..
Just as hunters pattern deer for deer season, I pattern groundhogs and other varmints. By arriving at the peak times of activity, I make my hunting time more productive. Don’t think this is the only time to hunt, however, for I have effectively hunted groundhogs all times of the day. Groundhogs do not live in large colonies like prairie dogs. With prairie dogs, a hunter can shoot hundreds of shots in a day, whereas three to five groundhogs would be considered a good average for an afternoon’s hunt. The groundhog hunter needs to become acquainted with the habits and habitats of his quarry since he doesn’t have an overwhelming number of targets. Initially, I do a visual scan of the field to acquaint myself with the geography and then walk the perimeters. It doesn’t matter if you walk a field clockwise or counter clockwise, just do it the same way every time and don’t be in a hurry. Enjoy the walk and observe everything. There’s no telling what you may find. Once you finish walking the perimeters, walk the interior of the field doing what could be called a "grid search." When they dig their burrows, groundhogs often leave large mounds that are visible from a distance, but some also have burrows with no mounds, making them hard to detect. Only by walking the field will you see any hidden burrows. Then, too, unless you take the time to check the interior of a field as thoroughly as you checked the perimeters, it’s possible a number of opportunities might escape your attention, including deer sign or sign of other wildlife activity that might prove useful on other hunting expeditions. By the time I finish, I will have walked every square inch of this field. After the walkabout, I turn my attention to any drainage ditch, every groundhog hunter’s friend. This particular field sports a deep, serpentine ditch that runs east to west. The number of burrows located along the bank alone, not on the rim, is plentiful. 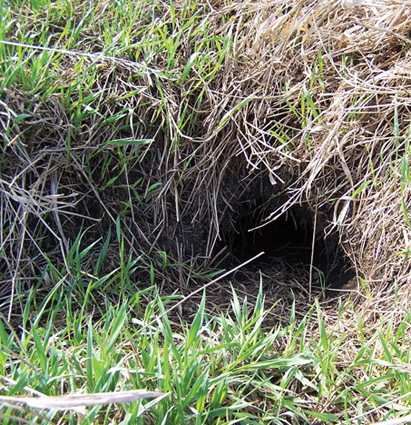 Take the time to locate these burrows early in the season before the grass starts growing as a number of the holes become camouflaged once the grass reaches 10-12 inches high. Search for burrows in the ground and holes along the bank on both sides of the ditch. Many farmers strategically place concrete blocks and slabs in ditches adjoining fields to reduce ground erosion. Groundhogs love to climb onto these blocks to sun themselves. Every spring, I cut down any cattails, trees or tall weeds, such as irises and road lilies, so they won’t obstruct my view of the groundhogs as they stretch out on these warm structures, basking in the sun’s rays. Deer hunters prune the branches and limbs away from their tree stands to create shooting lanes so they have a clear shot at their game. Woodchuck hunters can do the same thing. Cut down all the tall, gangly weeds that would impair a clean shot. Don’t hesitate to do this again should it become necessary later on in the season. Vantage point is everything. Usually, the best place is the highest point in the field. Terrain features and various safety issues dictate the vantage point, and there may be more than one. The primary vantage point covers the most real estate and the most burrows within safe shooting range. When I locate a burrow, I mark it by tying a 12-inch piece of surveyor’s ribbon onto an overhanging branch or nearby fence post. Using my laser, I measure the distance between the vantage point and these burrows and log the information in a notebook I carry in my vest pocket. I’ve been able to laser-range deer, but I’ve never been able to laser-range a groundhog because of beam disbursement. As a result, I end up lasering something within the vicinity of the groundhog instead. In those instances where poor reflective quality impairs my ability to get a laser reading, I drive my truck out in the field and park at the vantage point, and from the burrows, I laser the truck and log the ranges. 4) Don’t point the muzzle at anything you’re not willing to shoot. By following these four simple, safety rules, you’ll never have a grievous accident. Pre-season scouting and preparing an area to hunt shouldn’t be considered tedium. It’s a great deal of fun that could last anywhere from one week to four to six weeks depending on weather conditions and time constraints. Develop an organized system that works for you and use that system every time you work a field. Familiarize yourself with the field, locate the burrows, establish the ranges, check for safe angles of fire and then go home and start prepping your rifle and support equipment.